In the 48th issue of the Bed and Breakfast Traveller, we take you to Muskoka, located in central Ontario just ninety minutes north of Toronto. Fall fairs, antique and crafts shows, and other interesting events complement your driving tours through the region - see www.discovermuskoka.ca and consult their attractions and events lists. 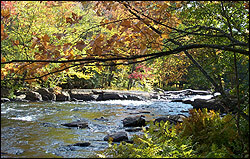 Don't miss the 20th Annual Bala Cranberry Festival on October 15, 16, and 17. This is a festival designed with the whole family in mind! www.balacranberryfestival.on.ca Come and celebrate the harvest at Johnston's Cranberry Marsh. Shuttle buses will take you out to the marshes where you can take a tractor or horse drawn wagon ride. Sample Cranberry, White Cranberry, and Blueberry Cranberry wines at Muskoka Lakes Winery at the Johnston Marsh. www.cranberry.ca, www.cranberry.ca/mlw. Bala has strong ties to Lucy Maud Montgomery - enjoy the Cran-Anne Look-Alike Contest. 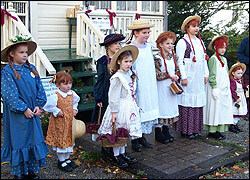 What would Anne (of Green Gables fame) look like if she came to the Cranberry Festival today?